It's not just a dual coil trying to emulate a single-coil. This is a true single-coil and it's the quiet, noise reduced Sensor design! 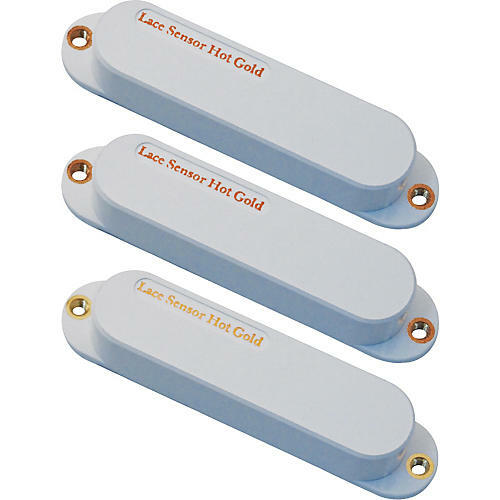 This revised and enhanced new Lace sensor Hot Gold has slightly stronger output. They retain all the definition of the regular Gold Lace Sensors but add a firm bottom and singing mid range. Excellent from clean to vintage growl. These Lace Sensor Hot Gold's have a fat, full bottom end, a singing midrange and all the high end sparkle and class you would expect from a killer Strat. Hear presence like never before. Three-notes into these guitar pickups and you'll hear the difference. Upgraded hotter barium ferrite magnets, Patented Lace Micro Matrix Combs for killer vintage tone, available with an optional Hot Bridge 13.2k for more power and cut for harder rockin' and searing solos. Or the Standard Set all 6.0k's for neck, middle and bridge for that traditional Stratocaster vibe.